Want to hear timeless truths of faith? For the generation that came to faith through the tent campaigns of Billy Graham, ‘Coming Home’ gives you a poignant and personal view from the man who pioneered that great age of revival evangelism. In this surprisingly forward looking retrospective, the great evangelist of the 20th – and 21st century looks to the future at least as much as it looks to memories of the past. Billy Graham boldly shares his experience of growing in faith and shares with you how, with the benefit of years, you can take a positive perspective on your time here on Earth in the present with in the light of the promise of Heaven. Confessing without hubris that he, "never thought I would live to be this old," the centenarian gospel preacher helps you answer the question; what is God’s purpose for you in your later years, and how can you align your life with it? Not only that, how can you live solely for this purpose not only learn to overcome your fears, struggles and growing limitations but actually grow stronger inwardly in the midst of what are only mere physical difficulties? As always, deferring to the Bible, he shows how God makes clear that he has a specific reason for keeping us here, and that growing older is part of God’s plan your life within his purpose for you. The truth is that God isn’t finished with you yet, but you have to find what he has for you to do. ‘Coming Home’ is the book where Billy Graham encourages you with a personal view from the greatest evangelist of modern times leading you into a new perspective on your purpose and relationship with God with experience of years that only you have. In rediscovering God’s continuing call on your life, the gifts of grace he has for you are revealed as an encouragement for yourself and those who look to you for an example and encouragement in their own walk with God. 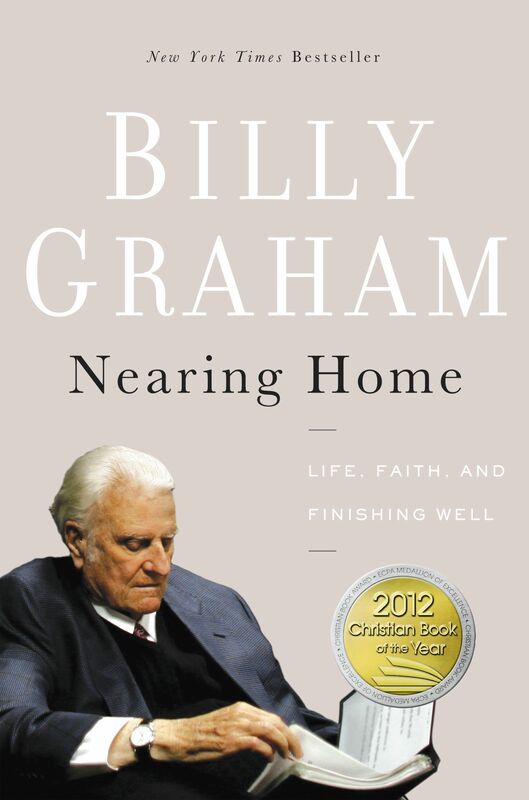 Nearing Home by Billy Graham was published by Thomas Nelson in May 2013 and is our 12281st best seller. The ISBN for Nearing Home is 9780849964824. Be the first to review Nearing Home! Got a question? No problem! Just click here to ask us about Nearing Home. In Nearing Home this man of faith - now in his nineties-explores the challenges of aging while gleaning foundational truths from Scripture. Billy Graham invites us to journey with him as he considers the golden years while anticipating the hope of being reunited with his wife, Ruth, in his heavenly home that eclipses this world. "When granted many years of life, growing old in age is natural, but growing old with grace is a choice, says the author. Join Billy Graham as he shares the challenges of fading strength but still standing strong in his commitment to finishing life well. "Billy Graham is the master of keeping things simple, and of communicating the message of the gospel leading to peace in one's life like no one else I know. In this short book Graham honestly and simply addresses the aches and pains of aging, preparing for and how to handle finances, what to focus on (what will last beyond the grave), and what to spend your time on so that you will indeed finish well." - Other retailer's Reviewer. "This book is full of his personal insights and biblical insights that are comforting to the reader. This is one of those books that you get excited to read it because it is from Billy Graham and especially at this stage in his life, but this is one of those books that make you relaize that you have been given a special gift and that gift is personal advice from one of the worlds most loved spiritual leaders." - Other retailer's Reviewer. "For me, the most surprising thing about the book was reading Dr. Graham's brutal honesty about some subjects. But then, would we expect anything else from such a man of integrity? For instance, he writes at one point.. "I can't say that I have liked getting older." And that the decision to retire from crusade ministry came "somewhat reluctantly. "- Other retailer's Reviewer. "Billy Graham brings everything down to ground level when he talks about God preparing him for all aspects in his lifetime, except how to prepare to go Home...very enlightening as I enter the later period of my life and know that I can still be used by God. " - Other retailer's Reviewer. “I never thought I would live to be this old,” Admits the author as he introduces you to his call to the service of God with the benefit of years already spent seeking and finding his presence. In this candid style, Billy Graham talks about the burdens and sorrows that press down upon me at this stage of my life will be over sooner rather than later, and that, during the last year, the physical ailments common to old age really have taken their toll on him. He looks forward to the day he will be reunited with Ruth, his beloved wife and best friend for almost sixty-four years, who went home t God in 2007. Although he rejoices that her struggles with weakness and pain have come to an end, he still feels as if a part of his has been ripped out, and he misses her far more than he ever could have imagined. As he says, with good humour: “No, old age is not for sissies.” Yet that isn’t the whole story, nor did God intend for it to be. Because although the Bible doesn’t gloss over the problems we face as we grow older, neither does it paint old age as a time to be despised or a burden to be merely endured. Nor does it condemn us to useless and ineffectiveness, endless boredom or meaningless activity. Rather the Bible says that God has a reason for keeping us here; if He didn’t, He would take us to Heaven far sooner. In this book, Billy Graham invites you to explore not only the realities of later life but the hope, fulfilment and joy that can be yours once you learn to look at these years from God’s point of view and discover His strength that sustain you day by day. His book helps you discover what it means not only to grow older, but, with God’s help, to grow older in grace. For yourself or for another, this is the book for helping you to build strong foundations on the gift of years, facing life’s transitions such as retirement and the loss of loved ones, continuing to make wise decisions and deepening your understanding of our glorious hope.